Fern & Flora: Valentine Giveaway!! Welcome to our V-Day Giveaway! It’s one month exactly from Valentine’s Day and our give away will have you ready for the festivities faster than you can say 'be mine'! This lovely collection of goodies includes packages of note cards, postcards, stickers and gift tags. These clever cards and whatnots were created by Kara Rosenberry just for Valentine’s Day! The winner will also receive the one-of-a-kind handmade Darling Dear headband and a little wreath made from vintage paper, beads, and buttons by Fern & Flora Designs. Please be our Valentine and enter your name into the drawing by doing any of the following listed below. Earn an entry for each option. The more you do, the more times your name is entered. 1. Visit Kara and Emily’s Etsy shops and then come back to either blog and comment on a favorite item from each shop. 2. Become a follower of Kara and Emily's blogs and leave a comment if you follow our blogs already. 4. Purchase an item from Kara or Emily's Etsy shops and leave a comment on either of our blogs. Every item purchased equals an additional 3 entries! p.s. If you enter but don’t have a blog, please leave your email address along with your comment, so we can contact you if you’re the lucky winner! The winner will be announced on Monday, January 18. Don’t forget to leave a comment for every entry you make. Best of luck! Okay, I already entered on Kara's blog so I am not sure if I can on yours as well. Just in case...I love your Darling Dear Headband and I love Kara's Bee My Valentine Postcards! I told you I would be back today! I follow Kara's blog as well! January 18th is my 33rd Birthday, this would be a wonderful present if I were to win!! Take care and thanks for the chance! What a fun giveaway!! 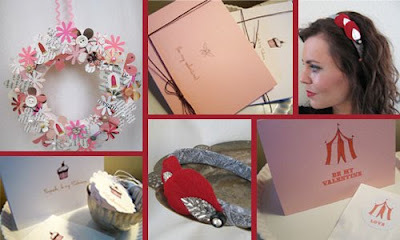 I love your Vintage Paper Wreath, and the Cupcake Note Cards from Kara's Etsy shop!! Thanks for the chance!! From Kara's shop, I love the Fifi in Paris line, especially the Fifi in Paris Garland. From Emily's shop, I love the Starry Night Headband. Are we supposed to comment on both of your blogs or just one? Commenting on just one blog is fine Minday. Thanks so much for bloging about this! Good luck! This past December, I bought a few headbands of Emily's...which were a BIG hit for my sister and soon to be sis-in-law who received 2 of these fabulously designed headbands for christmas. My sister also LOVED her new stationary, creatively designed by Kara!! I love what you ladies make and can't wait for your next get together! definately the valentine paper wreath! Love your beautiful site. I am now a follower, so glad to have found you! I am so loving your Valentine's wreath from your etsy shop. Love the headbands too! So sweet. I follow you and Kara and love both your blogs! Hope I'm not too late! Your starry night headband is already on my list of favorites for Etsy, but I'm totally loving the first date headband!!! I love Kara's chandelier and nest cards.